It’s September 22nd, which officially marks the equinox. Autumn is here! A dreaded time, when temperatures drop and clocks change, the days become shorter and we start to wrap up warm! But thanks to my trusty fatyak, I’ll be keeping warm with my memories of summer! After the amount of fun we had last time, S and I decided it was the perfect time to go kayaking again! We now have a kayak each, and a set of wheels to carry them down to the beach. We live about 15 minutes away on foot, so it’s not too hard to wheel them both down the hill together and get started. When we arrived at the beach we were immediately glad we had chosen to bring the ‘yaks, as it was PACKED!! Gone are the days we go to the beach to relax, our kayaks have given us a better option! Pushing our way through the crowds, almost knocking a guy out with our oars. We finally manage to launch into the water together and start pushing out to sea. Although the beach is popular for kayak and paddleboard rental, we instantly notice the change in atmosphere… Silence! A busy day on a beach brimming with people has just become a sunny, fresh day, reserved entirely for us! We giggled about this on the water and remarked at the difference it made. Peace and quiet with beautiful crystal blue water all around! Bliss! We headed up the coast and had a bit of fun paddling around, but we weren’t here to exercise on this sunny day, we had a plan! Just a 5-minute paddle from the bustling sand we launched from, is a small cove with a tiny private beach. Armed with a disposable BBQ and a goody bag of food, we headed towards it. Our perfect little private beach, for a romantic sunny BBQ picnic day! As we neared the beach, and the waters became shallow, we marvelled at how clear it was! With the weather, this amazing sea, and the privacy. It was as if we had been in the Mediterranean for this day! Pulling our kayaks onto the sand. S unpacked our Moroccan style picnic blanket,and we stopped to relax and bathe in the sun for a moment. We could hear nothing but the gentle sloshing of the water and the call of distant gulls in the air,with our kayaks bobbing about on the shore. Snuggled on that blanket, we could have been a thousand miles from home, it was beautiful. Once we were relaxed and content, it was time to get the food going! We had bought burgers and salad provisions with us, so it couldn’t last too long in the sun! Unwrapping our cheap disposable BBQ, putting a couple of pulled pork burgers on the white coals and preparing our buns with cheese and salad, this was a well prepared and deservedly delicious meal. Lots of mayo, lettuce, tomato, cheese, and of course toasted brioche buns. Incredible!! We could have always made these at home, but nothing beats a Burger made on a BBQ, nothing beats a BBQ on a beach, and nothing beats a private beach!! As we relaxed, full, content, and happily making the most out of this day, a memory was made of pure happiness. Its a memory that sticks with me now as I think of the cold that’s approaching this autumn. The memory keeps me warm inside no matter what. It’ll be summer again soon, and we’ll be doing it all again! I can’t wait! …we’ve got to make the most of the cold weather too: rest assured, no matter the weather we’re still on the outdoor journey! We’ve booked to climb the last of our UK peaks on new years day – we’re tackling Scafell pike in the snow! Its going to be great!! We’re back and have sat down to write our new stage of the travelogue. You may have read my anticipatory blog post a while back, but we finally did it. Here’s how our journey to Ben Nevis and the highlands went. It’s a long post, so bear with me – or, just read the bits you’re interested in, with the handy titles! Note: The images, unfortunately, aren’t as good or as often as I would have liked, due to the weather conditions. Before leaving we had a lot of prep to do. Organising our Travel and where exactly we were going. Not to mention ensuring we had all the correct equipment to survive for a week in the wilds of the highlands! I was pretty insistent that we needed a new tent. My £15 tent, bought hastily from The Range for a festival (the one that got me soaked at Dartmoor when it didn’t even rain!) was not going to cut it for a week in possibly rainy, windy conditions. So, after much online research, I had narrowed it down to the Vango Banshee range. Both in my budget, and reasonably lightweight, this tent seemed perfect to carry with us and to camp in slightly more heavy weather conditions. You never know what weather you’re going to run into, so best prepare for the worst. I found a local shop that sold the tent and tried out the banshee 200 and 300. They’re essentially a 2 and 3-man tent, but they’re a squeeze. Due to the fact we’ll have a week’s worth of supplies with us, I opted for the 300 as we needed that bit of extra room, and I’d shoulder the extra weight. It wasn’t much more anyway at 400g heavier, the weight of a tin of soup! Also, I needed a slightly better rain jacket and a few extra bits for warmth, but nothing too pricey! Next was the issue of water. We wouldn’t be able to carry tons of water with us because of the weight, so we bought some filters and purification tablets, planning to boil any water with our trusty Kelly kettle. And finally, I considered taking a week’s worth of supplies in the pack I took to Dartmoor and laughed to myself. As much as I love the Forclaz 30 Air + (It is a thing of beauty) I needed something much bigger. I did some hunting on Gumtree and found myself a Gigantic Vango Sherpa 65L rucksack. Being second hand, it’s a little more rugged than I hoped, with a broken clasp and some tears, but it would do the job. It successfully Packed everything we needed safely inside! Both the huge sleeping bag and the tent, with all my clothes and extras on top, with room for lenses and bottles etc. in the added pockets. Amazing! On the 17th we set off on our journey. Not the most exciting start, as it began with a Megabus ride (as most of our budget trips do!) at 10am from Cornwall to London. A long journey throughout the day, which was helped to pass a little quicker with good company (of course my other half, S was with me!) and my trusty DS. A journey on a mega bus isn’t the most comfortable, but for the price, it’s unbeatable. Plus, you get the bonus of Wi-Fi and charging ports along the way, meaning your electronic distractions will keep you occupied until arrival! We eventually arrived in London at Victoria station; unfortunately, our budget travel option meant we now had a 5-hour wait until the next leg of the journey! We had arrived in time for dinner and headed to a nearby pub for some well-deserved food. Sitting on a bus for 8 hours with no food means you work up quite the hunger! Luckily the Wetherspoon’s at Victoria station has a nice big sofa for us to chill out at, eat a giant burger, have a drink, and generally, waste some time before heading back to the coach station departures area refuelled and ready to catch our next ride at 11:00pm. Now this was a new experience. We had ordered a Megabus sleeper coach to take us from London to Glasgow. Scheduled to leave at 11pm and arrive at 7am, we figured it’s the best and cheapest way to get to our destination. Close your eyes, and the next thing you know, you’re in Glasgow! Upon boarding (loading our GIANT trekking bags onto the bottom of the bus) We’re greeted with a box of water and a box of muffins. That’s our sustenance for the trip. Tasty! We had pre-booked a double bed, so were ushered upstairs to find it. The beds are folded down seats, with sheets laid over them, and a big divider between us. A bit weird to have a board between us, but perhaps a welcome addition if you’re paired up with someone you don’t know! Although it’s a bit disconcerting that they have a single hammock that hangs above the double beds – so we had someone we don’t know sleeping directly over us! Everyone quickly settled in, electronics connected to chargers/ Wi-Fi and the lights go off. I’m a night owl, so find it harder to drop off at night. I stayed up with my DS, entertaining myself before finally dropping off! Eventually, I drifted off, and although I did wake up a few times to bumps and corners, I got an adequate amount of sleep! S seemed to sleep like a log. I awoke to some sharper turns and more bumps. We must be off the main roads and in a city! I turned my head, and notice it’s pretty light already! We’re an hour earlier than we expected. I’m sure that’s great for the driver and most people on board, but I’d have preferred some more time to rest! Oh well! We were the last one’s off the coach, groggily gathering our things into my dry bag and heading off. Stopping on the way out the door, to grab a complimentary apple juice and croissant! Lovely! We sat at the Buchanan bus station and gathered ourselves. Now – Where do you go when you arrive in a new city at 6am? My first instinct was to head for Glasgow Central Station. Surely it would have 24-hour coffee shops? After a bit of wondering and finally finding it, we had no such luck! After a bit of waiting around and googling, I managed to find a Coffee shop nearby that opened at 7.30 (6am if it wasn’t a Sunday!) Perfect for another waiting period, taking us on to 10am, when we pick up a rental car. Heavy usage of phones to keep us occupied, meant charging points and comfy seats were a great bonus to go alongside my absolute love of coffee! Glasgow Also Has a Lot of Beautiful Graffiti! As 10am rolled closer, we headed towards the company building in advance. Our train of thought in regards to travel was that 2 coaches could get us to Glasgow on a budget, but then we would need the freedom to travel around the highlands. I managed to find (using Skyscanner) a car for the week at just £40. Perfect! This combined with the coaches would be much cheaper than running our car all the way up here, and we avoid putting 1000+ miles on the clock. As we neared the rental building, we see what we’re going to have for the week. We’d ordered “A Fiat 500 or similar”. Nothing fancy, but cheap and gets us from A to B. It turns out we had a Smart Fortwo! Oh god! After a surprise insurance payment (paying extra means my excess reduces if something happens!) and an extra £30 for the fuel in the tank, we were on our way. Giant bags in the boot and back seat, heading off up the M8 out of Glasgow and beyond. Unfortunately, (as was the care with most of the trip) the weather wasn’t on our side. Clouds loomed over us as we drove, and rain was almost always with us. It’s a shame, as I was sure driving up through the roads of loch Lomond we should be seeing towering peaks and a beautiful Flat Loch next to us. Instead, we had fog and clouds obscuring any beauty, leaving us in a mysterious grey void for much of the journey. It was on this journey that I realised maybe this Smart car wasn’t a bad thing. Being a new model, it has some clever little features like a speed limiter and cruise control. Something I don’t have on my own car. It also has an eco-monitor, which gives you a score out of 100 telling you how economical you’re driving! Perfect for our 200+ mile round trip! I think I managed to keep it around 75. Not bad considering my usual ‘lead foot’! It also had a handy mount for our phones to navigate, and two USB chargers we could use each. A great little mobile base camp! Our destination unclear, we just kind of… drove! We had a few ideas, but nothing set in stone. We knew we had to find somewhere to sleep for 5 nights in accordance with the Scottish Outdoor Access Code. With no knowledge of the area, it’s difficult to know exactly what’s a good spot and what isn’t. We considered camping on some smaller hills and Bens, perhaps around Loch Lomond and Glen Coe; leading up to Ben Nevis to conquer it on Wednesday when the weather forecast was best. Ultimately we decided to go straight to Ben Nevis first. S suggested we tackle the big peak first, then see how much energy we have for everything else, as it would be a shame to leave Nevis at the end of the week and be too tired to climb. I think this was the best idea, and I’m glad we did! As we travelled, we caught a glimpse of Loch Lomond and as we drove out into Glen Coe we were in awe of the peaks reaching out into the clouds. If only it was clearer! Still in shocking weather, being pummelled by the rain, we arrived at Fort William, the home of Ben Nevis. First stop: the supermarket. As we’re tired, our plan was to camp at the foot of Nevis that night and make our way to the top the next morning. We needed supplies! Buying some water bottles to take with us, and some easily-heated tinned food, we made use of the supermarket to keep us strong and well-fed as we climbed the next day. Next on our list was to visit the outdoor stores nearby. It’s no surprise that Fort William has a wealth of outdoor and climbing stores in the town! Catering for all budgets and ‘seriousness’. We got some extra fire lighters for the Kelly kettle to ensure we had hot food. I really should have purchased some waterproof trousers, but I remained foolishly optimistic about the weather. Lesson learned I suppose! By this time, the day had almost passed us by, and we needed to find a place to camp as soon as we could! The first thing we did on leaving Fort William was to go the wrong way! With our phones directing us the wrong direction, we almost climbed the north face of Nevis. Not what we wanted for our first time in this weather! We were after the mountain track. We turned around and headed back to Glen Nevis. The valley at the base and the start of the Mountain Track. Driving around, we found one car park, which didn’t mention anything about staying overnight, plus we’d neglected to bring any change, so the public car park was out of the question! After much deliberation, studying the Scottish road laws, and researching other people’s anecdotes with our phones, we finally decided to leave the car in a layby right next to the youth hostel. This adjusted our path a little, as I think the hostel path is slightly steeper. We parked up, unloaded anything completely unnecessary, loaded up with our new food and water, and headed towards the track. I’m still not completely sure on the rules, but I read online before leaving that camping around Glen Nevis is not allowed, because of the proximity to the road and to alternative sleeping options. Therefore, we continued onwards and upwards, higher and higher up the track, hoping to find a flat area to pitch the tent – there were a few viable areas at Snowdon, so Ben Nevis can’t be too different right? We climbed higher with our packs. Keep in mind, my 65L weighed about 30KG, and S’s 45L bag weighed about a third of her body weight too! It was pretty tiring, to say the least. The rain was non-stop too. Freezing cold wind battered it against our faces, and we pushed on higher. We met a few groups of people who were on their way down, and they looked at us like we were crazy! “Be Careful” was heard a few times, and by all accounts, the wind at the peak was 80mph. I don’t doubt that; The wind on the first half of the mountain alone was strong enough to move us as we walked! We kept to the inside of the path and took it slowly and carefully. It wasn’t long before we stopped for a break. I removed my bag’s rain cover, went to grab my water supplies, only to find there weren’t any. The bottles I had placed in the bag’s side pouches were empty! They must have dropped out as I removed my bag from the car. We shared the small amount that S had brought with her and pushed on. 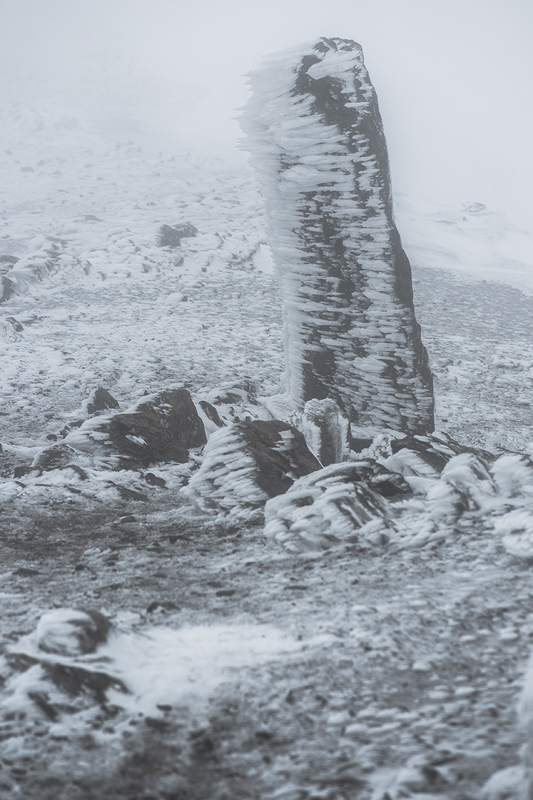 The climb got harder as we continued, with the weather getting worse, visibility low, and energy running out. We made it out of the initial Zig Zags, continued around the first peak, and up the side of the valley of the Red Burn. We could see clouds rising up through the valley, covering us and continuing upwards. We followed and eventually made it to the first flat ground of the climb. Taken 2 days later in much clearer weather! Known as the half-way lochan, we had climbed a bit higher than we expected. Absolutely drained of energy and desperate for shelter, we left the path and searched for a flat section of ground offering some cover from the wild winds. Most of this area is wet ground, due to the runoffs of the mountains, draining down into the loch. 30 minutes of searching for the perfect spot and we finally found one that would do. The ground slightly wet, but certainly not the worst. The best part is that slight lip sheltering us from the wind. Setting the Bag down on its waterproof cover I opened it up and pulled the tent from the separate lower section. I’m glad I packed it separately and see why it’s a much-appreciated feature of the bag! We needed to work fast to get the tent up. Now we’d stopped moving, we were getting considerably colder fast. We now had to face a new problem. We bought the tent 2 days before we left, and have AstroTurf at home in the garden. Do you see where this is going? How does the tent go up? Barking orders at S to stop things blowing away, and give me pegs, I worked out getting the tent laid out in the flattest area I could find, battling the wind and trying to stop as much rain getting in as I could. This seems straightforward, but assembling a tent in the wind and rain is never easy. Especially when you haven’t done the important dry run! The outer layer up, I rushed S inside with our bags. Keep her safe and warm with our stuff – I’ll peg everything out and make sure it stays in place! Once I was finally happy the tent was secure (And I had done it properly) I jumped indoors to help S hang the inner sleeping pod. It’s warm in here. And dry. I think the feeling is coming back to my hands…! The wind whipping around and the rain battering the outside of the tent, we were warm, drying off with our amazing little microfiber towels, and attempting to warm up in our sleeping bags. The tent was amazing! I’m so glad I bought it. I could stretch my legs out this time, and I was dry! And there’s plenty of room for us both, with bags. Amazing. Exactly what we needed, and it’s doing an impressive job keeping the weather at bay. And what weather it was. I think I can admit now that I woke up frightened more than a few times. The wind was blowing hard, and I constantly checked everything in the porch and near the edges to make sure it wasn’t getting wet. The Banshee did well, though. Not a drop of water. No condensation. No wind damage. She held strong through the night. As we settled in, tired from the climb with our bags, tired from 36 hours of travel, tired from a restless night on a coach; Sleep didn’t take long, even to the sounds of nature mercilessly shaking our tent trying to get in, we slept pretty well. It turns out that we had camped in a cloud. Or multiple clouds, I suppose. The problem with being on the first bit of flat ground is that all the clouds that rise up out of the valley, follow the path of least resistance over the Loch. And us. The entire night we were pummelled by wind and rain and awoke to the same. Opening the tent flaps gave us no indication of where we were or what the weather was up to. You could barely see 10 meters! It wasn’t raining, but rain was hitting our tent! I guessed that perhaps the moisture in the air, coupled with the strong winds, was blowing all the cloud and its rain over our tent, rather than it falling from above. An odd experience for sure. We waited in the tent for the weather to blow over. It didn’t leave, however. We had three options. Staying in the tent and wasting a day doing nothing, Take the tent and our heavy gear down and climb back up with water and food provisions only, or leave our base camp here, and continue up in the treacherous weather without our bags. Wasting a day didn’t seem like a good plan, so we kept a close eye on the weather, opening the tent flaps whenever the wind and ‘rain’ calmed down. We decided we certainly needed to eat before anything else, so I dressed, got a few rocks to prop the kettle up, and started heating our breakfast. Tinned mac and cheese; delicious. Now we have some strength, it’s time to make a decision. 12 o clock came by and after constant squinting, through the fog-clouds, I thought I saw someone on the trail. Not just someone, but multiple people! I counted 14! Are people climbing even though we can barely see the Loch most of the time? They’re crazy! But if they can do it, we can! It turns out the weather wasn’t as bad on the trail. I mean it was bad, but at least you could see. It turns out the weather was only really bad where our tent was. It turns out we had camped in a cloud. Nobody will steal our tent or sleeping bags, we’re halfway up a mountain. Let’s just go up with the bare minimum. I took my camera in a dry bag, S bought a small bottle of water we had filtered from a stream. Covered in waterproofs (other than my legs, jeans still wet from yesterday) we started the rest of the climb. It soon became pretty obvious that the weather wasn’t as bad as we thought. I think being in a tent amplifies every little gust and rainfall, making you feel like the whole world is against you. It wasn’t a clear sunny day, but there were parts of the path where you could see back to the tent! Imagination was needed in most places, and I was often left wondering what the view could be like if we had a clear day! It turns out that a small bottle of water isn’t enough for two people sharing to climb another ¾ of a kilometre upwards! The climb was very hard, our legs still wobbly from carrying the bags up the 600m elevation to the loch, we struggled much more than with Snowdon, although the path was clearer. I’m not sure how we managed Snowdon without any real provisions, it must have been the difference in rest, as this time was much different. I’m sorry to say I really struggled, even carrying just my camera in the dry bag. As we reached around 1000m I had no energy, I felt like a zombie. I continued on autopilot, but in this weird void of cloud and dampness, I was no longer happy or excited to continue onward. Stopping for a break on a rock, tempted to start licking them for water, a man stopped approached to pass us. He was also heading upwards. He stopped for a quick chat, and on realising we stupidly didn’t bring water, he very kindly offered some of his own, and not only water but a jelly baby each! Never have I appreciated the sweet taste more! Almost instantly my morale was raised, my energy was back, and I found my feet again. The difference in my spirit really taught me an important lesson, and I now know how stupid we were to continue onwards without bringing our own water. Realising my stupidity and the value of the water up here, I felt bad even taking a sip; but he insisted. Being prepared, he had two large bottles. The man was walking with Cara, a very soggy, very sorry looking dog. I think she felt the same way we all did. He had wrapped her up in a jacket and obviously loved her very much, making sure she had energy and wasn’t too cold. I love dogs, so seeing her making her way up the mountain was another boost in spirit! I’m tempted to say Cara is an Irish wolfhound, but being so damp, it was hard to tell! We started walking together, chatting as we went, Cara wagging her tail at people we passed – not far now! Only another 300 meters or so. Energy back and some new company, the rest of the way went pretty well. Then, as we got out of the zigzagging pathway, and onto the last straight, we reached snow! It’s too cold for paws, Cara wouldn’t be able to follow the rest of the way. The man wrapped her up in a fresh under layer and reapplied the jacket, hoping to warm her up. They wouldn’t make it all the way, and I respected that. He had helped us both this far, and his dog’s safety was more important than reaching the top. He gave us both another sip of water and jelly baby as a farewell. An act of kindness that sounds so small in everyday life, but in the cold, drained of energy, and soaked through, it was exactly what we needed to push on once more! Thank you very much. Not much farther now. As you reach the top of Ben Nevis the ground straightens out. You follow a trail straight ahead that leads you to a flatter section the levels out to the summit. Up here, again it was clouded. There was little visibility, so we continued following the trail, looking out for cairns in the cloud cover to guide us. The snow on the ground was gone again. It only seemed to be on a slope and hadn’t continued all the way up to the top. S loves the snow, and it’s one of the main things she was looking forward to. Luckily there were a few more areas it could be found, especially on the cliff edges of the summit. Again I imagine they would look incredible in clear weather! After stopping to appreciate the cliffs and snow, not much further we saw the marker ease out of the fog– we had done it! We made it to the top! Just like Snowdon, No incredible view, but a great feeling of accomplishment! We snapped a few pictures, and of course looked inside the emergency shelter – it doesn’t look very cosy, but I’m sure it’s been kindly accepted by many a climber! We were getting colder and wetter the longer we looked around, so it was time to head down. I’m glad we had the extra layers of warmth with us: I think my nose would have fallen off if it wasn’t for my bright red buff! It was really handy as a bandana when hot, and a balaclava/nose warmer when cold! It’s funny how much quicker and easier you go down a mountain! Excited at the prospect of food and water and a hot cup of coffee, we flew down the mountain, giving encouragement to anyone still heading up! As we started downwards, we were treated to some gaps in the cloud cover and were in awe of the expanse of the highlands revealed to us. I’d love to return on a day with fewer clouds, just to take photos! This was an extra boost in my morale, happy to have seen some beauty up here (other than S! ), not just grey! We continued our descent of the mountain, me snapping much more pictures now with the amazing landscape below us and feeling a little less tired! We even passed a few people with tents and cameras, I’d love to see if the cloud cleared for them. Although slightly envious, if it stayed how it was in the day, they wouldn’t get many shots! At the Loch, reaching the tent, our legs collapsed under us and we snuggled back down into our sleeping bags, warm and relaxed again. I made sure to gather a load of water in the 5L container we brought with us. Filtered and boiled, we cooked tonight’s food and made ourselves coffee and tea. This is the life. We conquered a mountain, we’re warm, we’re dry, we’re full, and we’re together. Sleep came easily that night. We awoke, now on Tuesday. Day 3 of our trip. Aching but content, the weather looking a little clearer today, but knowing we had to head down. We weren’t in a cloud anymore. The wind was still strong but the rain was all but gone, and we could see the loch! It’s tempting to go back up and see how it looks in the clear, but we were way too tired for that! Packing our stuff and heading down – these bags are a nightmare! We literally had all day, though, so we walked slowly and surely, taking frequent breaks, and drinking water (we finally learned). It took a few hours to get back down, being passed by many bag-less people! The mountain was path much clearer, It’s a shame we didn’t get that kind of weather going up! Reaching the car, we were exhausted! Being clear, it was hotter. I had sweated through my jumper and shirt! Gulping down water and collapsing in the car seats, we chatted to a couple of people in the camper next to us – they told us they were waiting for their friends: They were cycling from John O Groats to Land’s End and doing the three peaks on the way! I couldn’t even imagine cycling at all at that point: they had already achieved 60 miles this morning before they arrived to climb. Incredible. Safely on lower ground, we decided our next step was to get a well-earned giant meal! A quick Phone charge and a TripAdvisor search later, and we found exactly what we needed: The Ben Nevis Inn. We had a couple of Gigantic, delicious burgers and a refreshing pint of Crabbies ginger beer. On any normal day the food and drink here would be amazing, but as we sat here exhausted from our journey so far, the food was like no other! Exactly what anyone needs after an arduous climb! The views from the Inn are beautiful too. As the weather had cleared up by this point, we were treated to stunning views of the surrounding mountains. Great location, food, and drinks left us extremely happy! Satisfied and full, we went back to the car and thought of where to go next. We needed to start heading back to Glasgow, as our car needed to be returned on Thursday morning. We had one more day to spend sightseeing on the road, and two nights to find good camping grounds! S wanted to visit some waterfalls. Apparently, there was a sign on the way up, near Loch Lomond. That sounded like a good start. Also, now the cloud cover had cleared, I wanted to check out glen Coe. We had to drive through there anyway, so it seemed like a good point to stop off. Driving South, we headed down alongside Loch Linnhe, stopping off at a couple of spots on the way to appreciate the stunning natural beauty of the area. As we drove, the vast Loch was left behind, and replaced by the Breath-taking Glen Coe mountain range, the Bidean nam Bian and the three sisters. We decided we definitely had to sleep under these giants for the night! Seeing a tent near the road solidified this in our minds: We had to find a good spot! Just after passing The Meeting of the Three Waters, we stopped off at a car park because we spotted a track leading away from the road. I jumped out of the car and scouted it out. Further up the trail, it opened out to a stunning view of the mountains. The ground was dry and level too: the perfect camping spot! I ran back down the trail to tell S the good news. It wasn’t too far from the car, but far enough away that we were out of sight from the road. We took only what we needed for the night, to make our bags a little lighter than before! As we settled down, the weather did the opposite. I think camping up on the small hill attracted a lot of wind. We had the luxury of dry ground, but the winds were much stronger than the night on the mountain, it really whips through Glen Coe! Again, I found myself waking up during the night to check everything was dry and in place, but finding everything was safe. This tent is perfect! Awake and packed up, in the car and on the road. Our next destination is Loch Lomond and the Waterfalls S wanted to visit. We drove in awe of the landscape once more. Arriving at Loch Lomond, we stopped off at a few tourist spots and viewing areas to take in the beauty of the glasslike Loch. Taking the opportunity for lots of pictures! Eventually, S saw a sign. “That’s the one!” It was Falloch Falls we were after. Accidently driving by it, turning around and finding the entrance, we parked up and got ready. I recommend lots of anti-midge spray here! We had some jungle formula and mosquito bands, which did a pretty good job in the places where we were covered. You’ve been warned! Following the trail down to the river, you catch a glimpse of the rapids, and further along, it opens out to the falls! Beautiful! It’s definitely worth a quick stop off from the road. Lots of pictures and midge bites later, we were back on the road, singing the Jurassic Park theme tune for the rest of the trip. Away from loch Lomond and getting closer to Glasgow City. We had to take the car back to the rental place in the centre of Glasgow at 10am, which meant our camping spot would need to be really close to the city to get us there in time. We pulled over to find somewhere that suits that description; not realising in advance how difficult it could be to find a wild camping spot near the centre of a big city! Driving to a few spots, we eventually settled on Cochno Loch, near to Glasgow but also wild enough for camping! We got lost a few times, started to worry as a couple of hours were wasted, but finally found a local car park. Apparently, you could leave your car here, and walk to the reservoir nearby. We loaded up our bags one last time and got moving. Making sure to bring all our cooking gear and everything: This time, we had some tasty looking noodles to eat! As we walked, we slowly realised it wasn’t as close as we were led to believe. The path went on and on, and we were too tired from our week of climbing! It would take forever to get back to the car tomorrow in time for the rental return! I left the bags with S and ran on ahead, climbing up the ever steepening Cochno hill. (800ft) I think it’s about 2 miles uphill, and it was just too much for our final night. I reached the top, and it was a nice enough spot, but the lines between farmland and public land were a little blurred and after walking back to S, we decided it wasn’t worth risking a night out here. We returned, defeated, to the car. Would we have to sleep here in a car park? Although not exactly wild, a campsite would get us a pitch near the city for a small price. It was our only option, as it got later and our ideas ran out. Our final night wasn’t spent wild camping, but pitched on some flat grass for a fee, in a local campsite. On the bright side, there were showers! We wasted no time making use of this luxury before feeding ourselves and settling down for the night, to an almost completely still tent! What a treat! First thing in the morning: our alarms didn’t go off, but S woke up on perfect time. Great work! We packed up quickly and packed our bags completely back up. We couldn’t rely on the car as a base camp any longer, so everything had to go back! We made use of another luxury here: bins! We’d been carrying around all our collected rubbish from the trip, so it was good to clear some space and get rid of it all! Heading back to Glasgow, panicked about running out of Petrol on the rental car (they said return empty, but I hoped not to do that literally!) one eye on the petrol gauge, one on the GPS directions, and one on the road – we arrived in perfect time; if a little unorganised! Still half packing our bags on the pavement, the car returned. What now? Our Coach leaves at 11:30 tonight, and we’ve got time plenty of time to waste until then! We rang a hotel and asked how much a day at their spa is. Relaxing in Jacuzzi, sauna and pool is exactly what our bodies needed, and one of the best ways to waste time! Finding a voucher online for a reduced rate and heading across town, we lugged our bags another 1.3 miles to the hotel. It was so worth it! We wasted a few hours here, and headed off rested and partly recuperated – food! An amazing lunch in Slug and Lettuce, with some more time wasting, then off to the cinema to watch the Conjuring 2. A great sequel to a great horror film, and the first time I’d watched a scary movie in the cinema. I really enjoyed it! Still with even more time to waste, we settled around the corner in a bar, charged our phones and had a few drinks, before jumping on our sleeper coach and repeating the whole journey in reverse. That was a week ago now, and life has been hectic – I’m glad to finally get round to tell you all about how the trip went! Although the weather could certainly have been better, and we could have spent even more time in these incredible place, I’m so glad we went on this trip, and can’t wait to do it all again. I definitely learned to bring more water next time, though. And jelly babies. Following on from our Wildcamping on Dartmoor: Day 1 post – we leave the woods and head out onto the moors. Upon waking the next day, we packed our bags (always seems to be harder than when you’re at home, nothing fits in!) and got moving. As we didn’t have much time on the moors, we decided to take the car to another point of interest to make sure we weren’t wasting any time seeing the most beautiful places! Anyway – Our chosen destination was found, and a good walk around some tors to match. We stopped for lunch first – kelly kettle out, this time for some sausages in bread for some makeshift hotdogs! Perfect fuel! On the move again, we arrived at our first destination – an old pumping station, just outside of Princetown. We left the car here, and grabbed our gear, excited for the night ahead of us – we were heading for Foggintor Quarry! It looked beautiful online and I hoped I’d get to get some great pictures – it didn’t disappoint! We started walking south-east- up to Hollow Tor: – on the OS map I saw there is a small unused quarry here, but on arrival it was so small and was full of swampy moor water – not the most picturesque place to stay! so we moved onwards and upwards. up next was Hollow Tor. a great outcrop of rocks jutting out over the scenery – of course, we had to stop for a picture pretending to hang off the edge! When our little climbing session was done, we continued onto the next Tor, we could see it in the distance. Rundlestone Tor. not quite as impressive as the previous, but we still had fun climbing on the rocks and some good pictures. next up was North Hessary Tor – this one is pretty easy to find as it has a HUGE television transmission aerial on top of it!! I think we got a little sidetracked here, we climbed a stile into a field, thinking it would lead us to the Tor, but instead we found ourself stuck in a field, cut off from the Tor and surrounded by sheep!! Next, from memory of the OS maps , we needed to head west (I think we need a compass) we headed slightly more south than we wanted, and ended up heading more towards Princetown than to our quarry destination – but it’s ok, we soon corrected our path when I realised my error and got to see some amazing wildlife – a small herd of wild horses with their young foals nearby. I made sure to keep my distance and move slowly around them, using my longest lens! I love wildlife, but I’d rather keep my distance and appreciate them from afar – it’s safer for me and for them; I’d hate to scare the mother or the young ones! Continuing on and correcting our path, we found a trail at the bottom of the hill. Originally a train track that linked Princetown to Yelverton, this was used from 1800 to transport the granite mined from Foggintor Quarry over to Princetown, to build most of the town and Dartmoor prison. It was even used in Nelson’s column! The views around the area were amazing as the old track arced over the landscape below. As we drew closer to the quarry, you could see the rocks and landscape around us rising up – we approached the entrance… a tiny little stream and an overgrown path… this didn’t look like the destination we planned on! “Maybe this won’t be so great after all”, we thought. I climbed higher to have a look down into the Quarry – no water, and pretty dried out, what a shame. I didn’t give up hope though and started climbing down the other side, into the quarry, along a steep path. S followed me dubiously – I could tell she was a little disappointed and unsure if we should go on! I insisted she follow me and continued along the path, the quarry seems to branch off into another section, and as we navigated the bottom, it opened up into a great lake enclosed by cliffs! Breathtaking! This is exactly what we were hoping for. We stopped to appreciate the view – noticing that down one of the cliff faces was an instructor showing a student how to abseil! amazing! We checked the area and found the perfect camping spot for our tent, a little balcony of grass overlooking the lake, with just the right amount of room for our tent, giving us an amazing view as the sun set over the edge of the quarry. After the tent was set up and S was safely snuggled in her sleeping bag, I scouted out for some rocks to use as a base for the Kelly kettle’s hobo stove. luckily being a quarry there was plenty to be found. I set it up nice and level and got cooking! For tea tonight was noodles! (I must admit we did stop at a shop on the way to get an extra 2 litres of water! ) delicious with a bit of curry flavoring! We couldn’t help but marvel at a tiny little duckling and it’s mother swimming about in the lake below, searching for food and splashing around – I could have watched them for hours! Of course, I then set off getting a load of pictures of all different angles and found the perfect place to set up my camera for a time-lapse of the area with the sun setting over us. I didn’t pack a tripod for this trip, but it would have been handy! I found a good rock for it to rest on, but still, I was worried it’d fall! I think I left it for around 2 hours and hopped my way back across the rocks with a head torch to retrieve it after the sun was gone, stopping on the way to meet (and make sure I didn’t step on) a new friend who had jumped onto the path! When I got back with the camera, it was time for a quick cup of tea (yet again thanks to the incredible kelly kettle – I can’t hype them enough!) and off to bed! Being close to the water, condensation and the dew was getting heavy this night – although it didn’t rain, everything was DRENCHED! I woke u multiple times with a wet head, my feet soaked through my sleeping bag and freezing cold. I tried my best to curl up a little, but didn’t have much room! A pretty miserable night’s sleep, but eventually managed to drift off and get some shut-eye. I definitely need something better than a cheap ‘Festival’ tent. We awoke to the light spilling into the quarry behind us… and damp feet. We walked out along where the old hill cottages used to stand, now ruins where the quarry workers used to live. Appreciating the area and just how amazing it is , with nature overlaying the man-made structures, forgotten and left in the past. For all my videogaming readers, the quarry and the surrounding area looks like something out of “shadow of the colossus“, it was truly a sight to behold! She had forgotten to remove her new hat and my Sony RX100 camera from the roof! We pulled over straight away and checked – NOTHING! I drove back to the pump station , where we walked up and back to the place we turned. The hat and camera were nowhere to be found! I loved that camera to bits, it’s so great for travel photography! But even worse – the SD card with all our memories of the trip were lost! Heartbroken and with no way to find the lost items, we had no choice but to continue home. I’m hoping a good samaritan has picked up both of them in order to return them, As I noticed a lot of cyclists on the road. But nothing has been returned yet, even after our efforts to report it missing on facebook, to the police, and to the park rangers office. I’m disappointed that we’re missing a lot of good images for this post and for S’s blog too – but life goes on! maybe it was the moor’s way of telling us to forget our history, leave technology behind and live in the now. We’re safe and we had an amazing time, and that’s all that really matters. It was S’s last day of work as she’s going freelance, so we decided to celebrate by taking a weekend trip to go wild camping on Dartmoor! One of the only places in England where wild camping is permitted! The sun was out, and we were excited to get going! This was going to be both a fun getaway, and a trial run for our week in Ben Nevis that’s coming up next month! As we packed, we quickly found we’d have to be as economic as possible to save space and make sure we only take what’s absolutely necessary. We have a 30 and a 45 Litre bag, so with a weekend of clothes (and emergency rain gear! 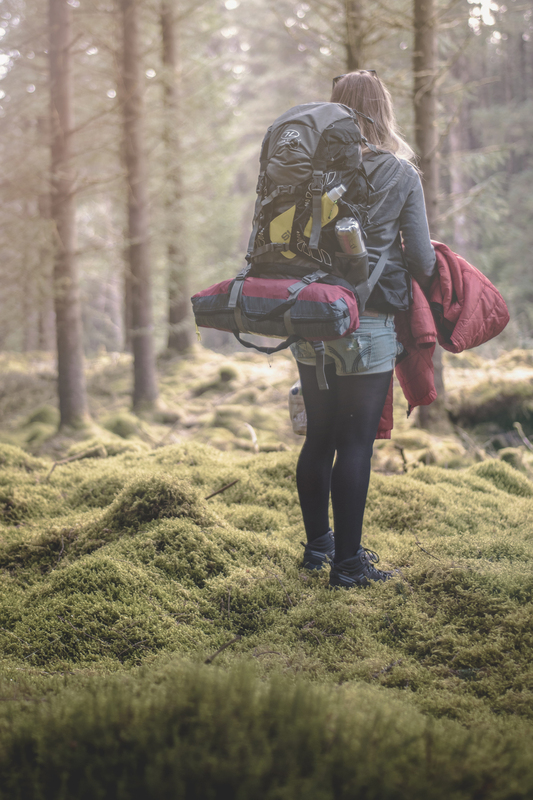 ), two of our 2kg sleeping bags, two self-inflating roll mats, a kelly kettle and a tent – it was a hard squeeze to fit it all without strapping everything to the outside and toppling over from the weight! When we were finally packed and satisfied with our efforts, we started our drive – about 2 hours including a quick stop to get fresh water and some tinned food. Not bad for a break from civilisation! As soon as you get to Dartmoor, you’re met by cattle grids and vast expanses of land all around you! An area of beautiful moorland left entirely to nature! It’s not long before you see all the wildlife too! Sheep EVERYWHERE! and because it’s spring, this meant hundreds of adorable baby lambs! Both gob-smacked by the landscape so close to our home, and by the cute little fuzzy white things beside (and often lying in) the road we were driving pretty slow and had to let a few people pass us so we could appreciate our surroundings! As we drove we saw some woods in the distance, and S said: “I want to go there!” With the Google and OS map apps, we planned a route to reach them. And reach them we did! As we walked with all our gear, the light grew dim and the temperature started dropping – we had a couple of great spots, but unfortunately – being woods – there were many roots and branches in the way that we either couldn’t or didn’t want to disturb! We were very concerned with not leaving a trace of our trip! eventually, we found a spot – not perfectly level, but clear of any debris and situated in a clearing! With little wind and no rain, the conditions were perfect for a night under the stars. The tent wasn’t huge (and can barely fit my 6ft height) but we managed to squeeze us both in, with the sleeping gear and our ‘luggage’! The priority now was food!! Using our incredible Kelly Kettle, we gathered some dry fuel and a flat rock base (to keep the area safe) and boiled a tin of stew we had bought earlier! We’d forgotten to bring cutlery, though! So slices of bread were used to pry the food out of the tiny travel pan. Full and exhausted from our somewhat unplanned trip we packed everything up, wrapped our waste in the bread bag (to guard against any creatures sniffing us out in hunger!) and set ourselves to bed. This is where we first realised just how much of a slope we had set the tent on! it doesn’t look like much in the image above, but with our self-inflating mats and our sleeping bags, we were constantly sliding down towards the back! we positioned bags to prop our feet up, and clothes under our head, and eventually fell into a slumber. I awoke a few times uncomfortably squished up in the tent – it’s one I bought for a festival some years ago and isn’t really cut out for heavy camping. I originally used it myself, and lay diagonally quite comfortably! I now realise that with S next to me, and with both our bags, that it’s impossible! My head and feet constantly touched the sides of the tent, so I either woke up shivering or woke up squashed! S, however, seemed to sleep quite soundly with the advantage of being smaller than myself! 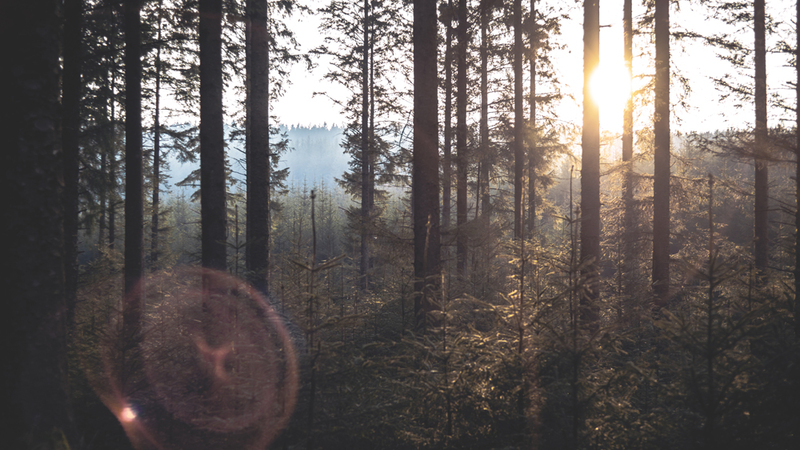 After a few false starts, I awoke properly – I could hear birds chirping and red-tinted light shone all around me. I was warm, I was awake and I was restless! I threw on some warm clothes (quietly, so as not to wake S) and went for a quick walk to explore the area – it’s so peaceful there. All you can hear is birds and the wind in the trees. No people, no traffic, no sirens. Just peace! It’s so relaxing being ‘in nature’ for a change, instead of being surrounded by buildings and a man-made environment. I think everyone should ‘escape’ and immerse themselves in the natural world as often as possible, and appreciate the little things. By the time I’d explored and arrived back at the tent, S was stirring and we prepared for another day – this time on the moors! Stay tuned for wild camping on Dartmoor: Day 2! We awoke bright and early, and after a good croissant breakfast and a warm shower, we were ready to conquer snowdon. I couldn’t wait to get back out into snowdonia and explore it’s beauty, let alone it’s highest peak! As we made our way along the 45 minute drive from penmachno village, we watched as the landscape turned more and more epic, opening out to the peaks surrounding snowdon! Excited to start, we pushed on as I snapped out the car window! We arrived at the car park, even the view from here was stunning, with valleys down below, and road winding around the edges. I found it incredible that people created all this in such a difficult environment! As we got to the parking machine, we realised we had no change! It takes notes, so make sure you have some with you. Luckily we were able to get change from the nearby restaurant and continue on our journey. This is where it really started! We decided to take the Pyg track up to the summit, and come back on the miner’s trail. I’d spoken to friends who had been before and they all advised that as a first timer, this would be the easiest and most enjoyable way to go. After actually doing the trails I think I agree with them and we’d decided on the best route for the day. Oh no! We don’t have ice axes or crampons! We decided we’ll keep heading up, and stop if we feel it’s getting too difficult, or we can’t find safe footing. I think we made the right choice, but please do consider this before you head off. There were some people we met on the way up, who had decided it was too dangerous and they were heading back. The climb would have been much easier had we packed proper snow equipment, but it never reached a point we considered dangerous to ourselves. 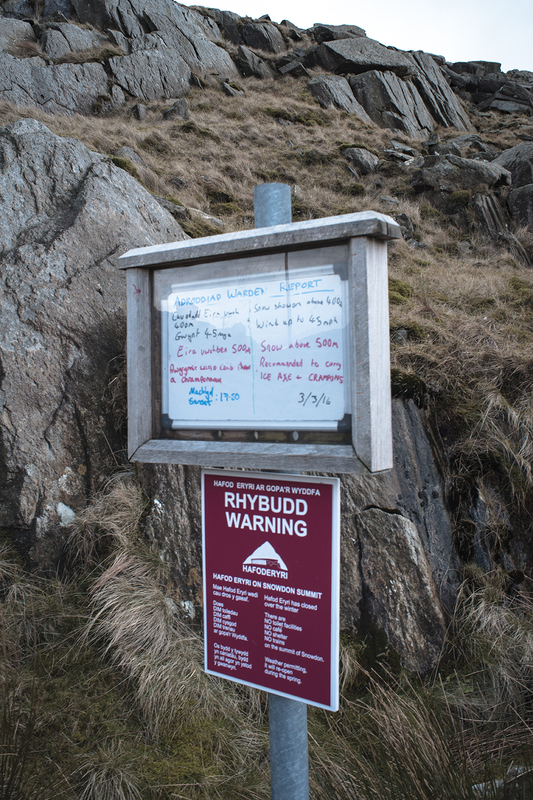 We also saw many signs around the start warning NOT to climb the closest peak you see in front of you. It isn’t snowdon! It’s a very difficult climb named crib goch, and should not be attempted unless you’re very experienced. It looks extremely difficult even from the bottom, and we didn’t even attempt it! It certainly wouldn’t have been safe in these conditions. As we walk up the stone steps, the sheer size already sets in. You’re really climbing a mountain! With crib goch out ahead, and giant valleys spanning to the right and behind you, it’s difficult not to stop and marvel at the landscape! That last pic is crib goch looming overhead. So as we continued on, I realised I was getting tired much too quickly. I had packed on the layers and was wearing a giant pea coat over everything. I realise now this was stupid – but I just didn’t have the gear I needed. The coat went into the bag and I continued on – my body heat was more than enough and kept me warm without that huge thing. I wish I’d left it in the car, but it became extra weight on my back! As you continue up the stone step, you eventually reach a bend, and get to peer down at the beautiful reservoirs below. It serves as a good indication of how high you’ve climbed already! It’s absolutely stunning, and S wanted to visit just this incredible view alone! We pushed further onward and up, slowly getting higher and higher, into the snow and wind! It was a bit worrying without ice axes and crampons, but luckily I have the karrimor snowfur boots I bought for our norway trip – they kept my feet nice and toasty! We met a few people travelling in both directions, we stropped for a chat to everyone on the way down to ask how they managed. Most said it was possible without snow equipment, and seemed confident we could continue! Great news! Because of the snow, it got a little difficult to find the trail sometimes! We even ended up climbing a treacherous face that we didn’t need to, because we went off track! As we got to the top stone steps, things got much more slippery, and we had to hang on to the fencing to keep our balance. This was the only part of the trip I felt was risky without Crampons – but we continued on slowly, being very careful of our footing and making sure we kept holding ourselves up! Although, as the point in the picture above, we stopped for a bite to eat, and S’s glove flew down to the bottom! Unbelievably we found it on the way back down! The very top of the pyg track, where it meets the railway, was the hardest part of the climb – It became extremely slippery and steep, and we had to crawl upwards, being careful not to slide at all. It’s difficult to show in pictures just how steep this section was. As we reached the top of this short section, we were pleased to see flat ground and the top marker! It was incredible to see how the extreme winds and cold had made icicles that stuck sideways to everything around us! I wish I could say that the view from the summit was the best I’d ever seen – but the cloud cover was too great! We were left with this! We had no shelter up here – S’s hair was literally freezing, with bits of ice in it, and the wind was very fast, so we decided to keep moving and head back down before we warmed up! It was an absolutely incredible journey, and it’s got us hooked – next stop Ben Nevis! It’s already booked for mid June! Sometimes when you’re stuck in a rut, going to work everyday and sitting at home indoors every evening you feel like you need an adventure. That’s why S and I planned a trip for her birthday: to climb one of the highest Peaks in the UK, Mount Snowdon. Other than brown willy in sunny Cornwall we haven’t really Had experience with climbing and especially not in the winter So it was going to be interesting whether it went well or not!! We set off early in the morning with a car packed full of bags (and camera gear!) ready for our stay in an amazing cottage that we found on airbnb last minute. The seven hour drive went reasonably fast, even though we had to take a detour from the motorway. Although this just meant we got to see even more of the beautiful welsh countryside. 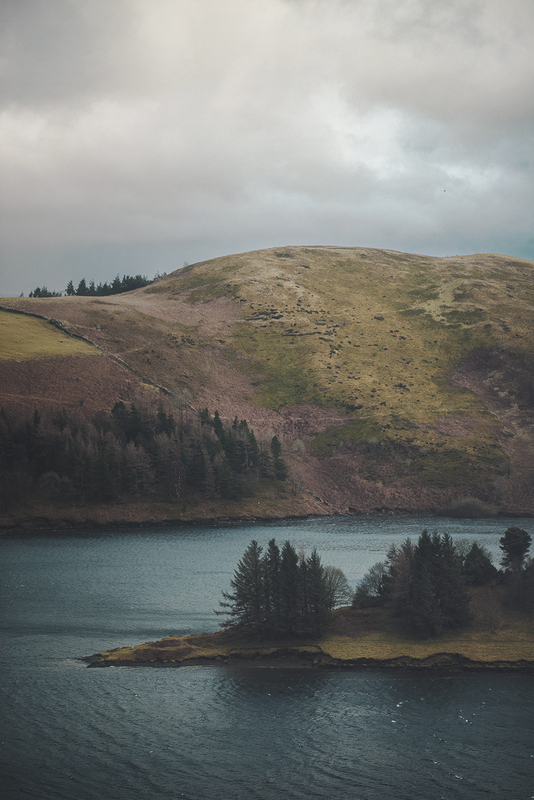 As we drove on, and the mountains came into sight I was stunned by just how beautiful North wales and the National Park of Snowdonia was, and had a hard job keeping my eyes on the road with such incredible vistas around me! I even had to get out of the car to take some snaps! On the way we stopped off at supermarket can get some food and provisions for the climb and the couple of nights stay, including some birthday treats for S! Steak for dinner tomorrow! By the time we reached the Cottage we were under the cover of night and had to rush through the rain to get all of our bags indoors – The weather didn’t look great for the climb! 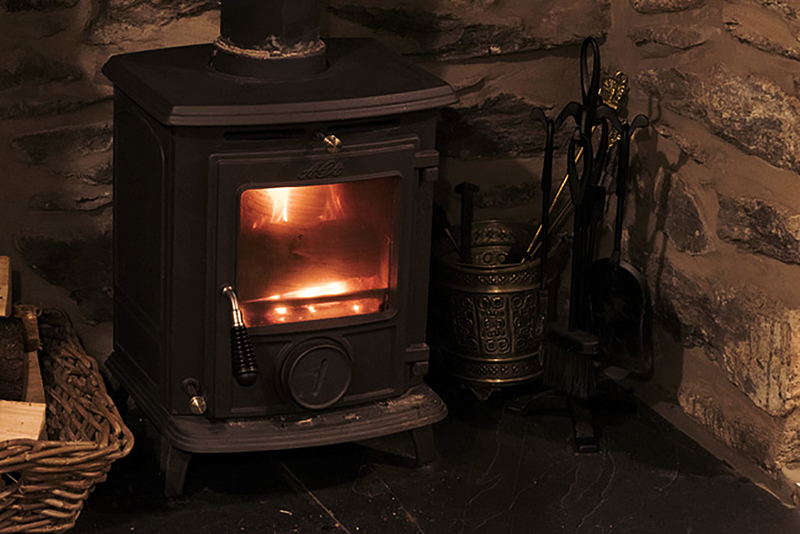 Once in, we were pleased to see a giant log burner aga fireplace, and didn’t take long to get it set up and make ourselves a tea. We didn’t stay up long as we had a mountain to climb tomorrow! How To Save Money When Visiting Kuala Lumpur On A Budget! Five Great Reasons You Should Be Kayaking Regularly!